Ralph Lauren’s men’s athletic line, RLX, recently released a new line of high-performance bags, one of which features an integrated solar panel. 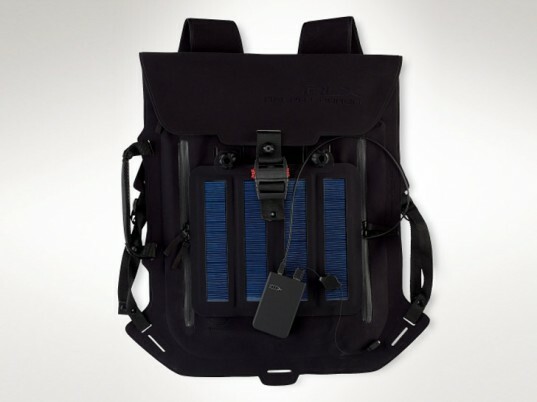 Made in Italy from a thin, seamless, and water-resistant material, the Solar Panel Backpack generates enough juice to charge an iPod or cellphone in a matter of hours. Luxury, style, and solar power, all in one. The RLX line for men is designed for luxury, technology, as well as performance, and the new solar backpack is befitting of that ideal. Besides thick adjustable shoulder straps, the backpack includes a handle on its side for use as a portfolio. Perfect for carting around your laptop or iPad on your next boating expedition, the carryall zaps up a 3.45 watt current, which can charge a small device in two to three hours when the sun is at full strength. The bag zaps up a 3.45-watt current, which charges a small device in two to three hours when the sun is at full strength. The backpack is available in orange and black for the princely sum of $795, although you can purchase an identical version, sans solar panel, for $400 less. Yacht owners only need apply. Cool idea but a little to pricey. Like to see a more affordable model maybe made from recycled sails or something. 400 without the solar panel is still a bit to pricey. Not sure what kind of technology you would need to sell solar panel for USD 400 / 3.45 Watt (115.95 USD/Watt). Maybe if you craft them by hand, on NASA-grade materials and equipment, would it reach such height of price. Even my calculator and smartphone don't have that kind of price tag, and there solar cells are built in. 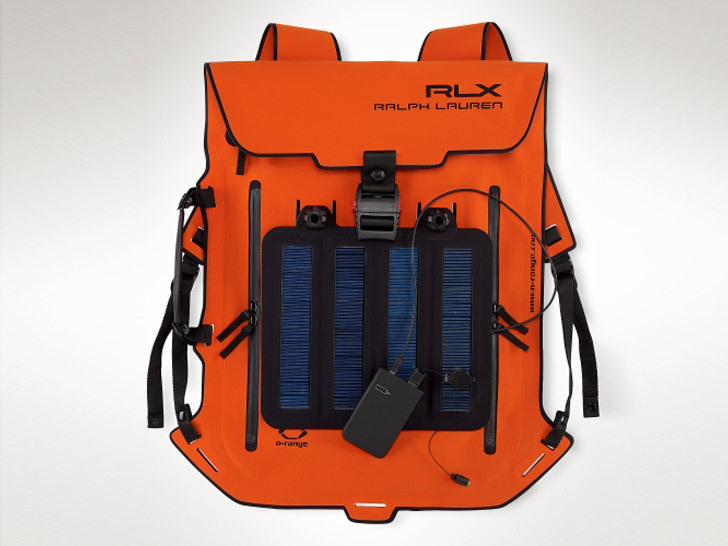 Ralph Lauren's men's athletic line, RLX, recently released a new line of high-performance bags, one of which features an integrated solar panel. Made in Italy from a thin, seamless, and water-resistant material, the Solar Panel Backpack generates enough juice to charge an iPod or cellphone in a matter of hours. Luxury, style, and solar power, all in one.